Camille Albane is the largest salon and beauty franchise in Europe and with over 300 locations, is now expanding into the US. Owned by upscale Paris salon chain Dessange International, which also owns Fantastic Sams, Camille Albane is making authentic French beauty and hair services available for the first time in the US. 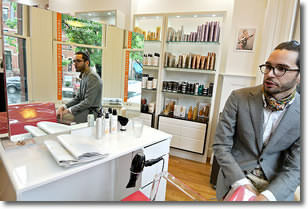 Customers are craving the unique and popular looks and service Camille Albane provides, making it worth researching for anyone looking at the hair and beauty industry. Although Camille Albane is an established and mature brand in Europe, we offer potential franchisees a ground-floor opportunity in the United States. Many prime metro markets are still available for salon development. Our franchisees will have the training, marketing and support systems of an almost 2,000-unit chain with decades of franchise experience. Camille Albane is already established as one of the most popular franchised hair salons in Europe for high-end beauty. We put out collections in spring and fall to coincide with Paris Fashion Week. The collections include haircuts, make-up and nail color. Our salons are not only in the world’s fashion capital, they extend everywhere from Monaco to Moscow to Saudi Arabia and beyond, and now they’re bringing the service tradition behind authentic French beauty to America. WHAT SERVICES DOES CAMILLE ALBANE PROVIDE? 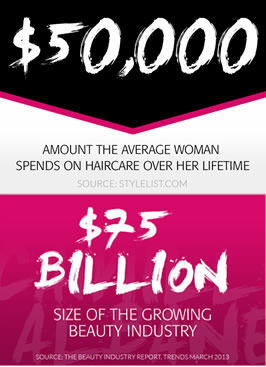 Our beauty salon franchises help every woman be the most beautiful version of herself. Hair: Our salons offer the best and latest in hair care – fashion-forward styles; defrizzing treatments; extensions; highlights, touch-ups and all-over color. Camille Albane stylists are highly educated in the latest skills and take classes from our Paris-trained educators at least twice a year. We stack the deck for success with high-level experience. We value the frequent technical training of our stylists that prepares them to deliver the elite salon experience our customers expect. Just as we make sure our staff gets the training they need, we also want to ensure that our franchisees have the safety net they need to build and grow a successful franchise. We’ve got an impressive team of experienced leaders at the helm. Our brand relies on the expertise and guidance provided by our parent company, Dessange International, whose oldest brand has 60 years of salon franchising experience. We’ve also put an exceptional team in place in Boston. Our team understands all the ins and outs of the salon business, and they are adept at positioning a team that plays to people’s strengths. And our franchisees can count on being able to access them when they need them. While some franchise companies frustrate their owners by being very hard to get in touch with, we pride ourselves on our quick response times. A passion for style is great, but business experience is better. Love design and understand the opportunity available to dominate the upscale salon franchise niche. Someone who has to be on the cutting edge; someone who wants to be first. An understanding of how to build brand awareness is a definite plus. Net worth of at least $350,000. 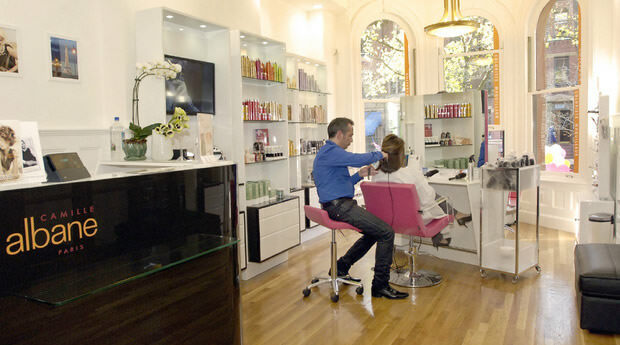 Our brand is undeniably different in the U.S. salon franchise space. With our focus on a luxurious customer experience, our fashion-forward techniques, our connection to Paris and our ability to generate profit, there’s nothing else like Camille Albane for your investment dollars. To join our team, fill out the form today! Camille Albane Hair Salon Franchise is currently accepting inquiries from the following states: Wyoming, West Virginia, Wisconsin, Washington, Vermont, Virginia, Utah, Texas, Tennessee, South Dakota, South Carolina, Rhode Island, Pennsylvania, Oregon, Oklahoma, Ohio, New York, Nevada, New Mexico, New Jersey, New Hampshire, Nebraska, North Dakota, North Carolina, Montana, Mississippi, Missouri, Minnesota, Michigan, Maine, Maryland, Massachusetts, Louisiana, Kentucky, Kansas, Indiana, Illinois, Idaho, Iowa, Hawaii, Georgia, Florida, Delaware, Washington, D.C., Connecticut, Colorado, California, Arizona, Arkansas, Alabama, Alaska. Interested parties should have at least $90,000 in liquid capital to invest.